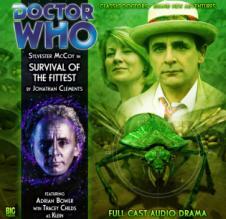 My review of the Big Finish Adventure Survival of the Fittest featuring Sylvester McCoy as the 7th Doctor and Tracy Childs as Klein is available at Amazon.com here. This CD features not one but TWO bonus stories, the conclusion of the Three Doctors saga featuring the Brigadier, Polly and Thomas Brewster and a special one part preview called Klein’s story with special guest star Paul McGann as the 8th doctor? Or is he someone else? As always you can pick up the episode at Mike’s Comics and you can listen to a preview here. and perhaps even a tad cruel. I got up for morning mass today but my youngest son who was at a party till very late asked if he could go to 11/12 at St. Bernards since it was closing. I said sure and decided to go with him although I was never really into St. Bernards. Well as it got near time to leave my wife mentioned that my mother would be going to the 2 p.m. at Madonna of the Holy Rosary also that last mass at that closing church, so at my son’s request we went there. I used to go to that church every now and again, it was close to my house as a kid and my grandparents belonged to it after it was built close to their neighborhood plus it was a missionary church of St. Anthony’s so there was a connection. The Mass was absolutely packed, the music was inspiring and the very long sermon of the priest who was retiring was one of the best he ever gave (he was an associated priest in my youth at St. Anthonys so I was very familiar with him.). There was an incensing of the altar, a sprinkling of holy water and an procession of adoration to our lady After the profession of faith he had everyone kneel and I saw something I never saw before, he started to recite an act of contrition and a fair amount of the congregation (those who knew it anyway) recited it as well, he absolved us and gave us a penance and continued the mass. At the end of the 2 1/2 hours the entire congregation stayed till the very end of the last note of the final hymn before going to a reception after mass downstairs. It was very beautiful but I found myself leaving the church very cynical. During the very fine homily the Pastor he departed from the gospel and readings for a moment and talked about the parish he had been pastor of for 16 years. He talked of the Garlic Festival and the famous Fish fry and how had people worked on them etc etc etc, but that was one of the things that struck me. When speaking of the church, he didn’t talk of weddings, funerals, and masses, it was the festivals the parties. It reminded me of something I overheard a few months ago concerning the church closings. Somebody was going on about shocked he was that Holy Rosary was closing, how much money they had in the bank, how new the building was (it is the youngest parish in town) and how big and well attended the festivals were. The person he was talking to replied, yes, those things were true, if only the masses were as well attended as the festivals. It was like a few months ago at St. Bernards, I had two different first communions to attend, one at St. Bernards and one at St. Anthony’s both have catholic schools that feed them children but St. Bernards is a much bigger church that has been around for 70 years longer, in fact it is the mother church of the city. Yet The church was not very full and the first communion class was smaller than St. Anthony’s which due to the number of kids receiving had to split things into two masses to accommodate everyone. The church is not about the size of the place, or the parties, it’s about the sacraments, the devotions and the worship. The other things are fine but one they take precedence over the actual worship of God then the church has already closed, the people just don’t know it yet. In various denominations we see it where social acceptance is more important than the word, in fact today there was a story about a church that took down its cross because it wanted to be “open to all views“. Once that happens its no longer a church, it’s a social club. There is nothing wrong with social clubs, but if your goal is salvation, a social club can’t deliver. The Lutherans, the Anglicans all have had this issue, and from my experience so do some Catholic Colleges. It’s sad but that’s the way it is, our fate is in our own hands, may we have the wisdom to choose the right one. My review of Big Finish #130 A thousand Tiny Wings staring Sylvester McCoy as the 7th Doctor and re-introducing Tracy Childs as Klein is available at Amazon.com here. It is not often that you see a sequel to an adventure, particularly one from 9 years earlier but the unresolved paradox of a Nazi from a future where Germany won World War 2 loose in our reality is practically irresistible and it works! Panetta is making the case of “self radicalization”, people who decided to become radicals on their own. This is a great example of denial and for some it is absolutely vital. If you actually suggest that there is an actual connection to radical Islam and terrorism, including in the United States then that puts you in the uncomfortable to have to make a decision to do something or not. Ignorance is bliss because it allows you to ignore things that you don’t want to face.